Gotleib & Associates, LLC is committed to providing superior service to our clientele. Each and every client is important to our success and deserves individualized attention. We offer our services to potential retirees in a professional manner and will never compromise our integrity. 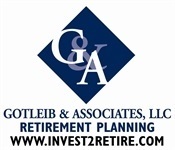 Gotleib & Associates specializes in transitioning employees from large corporations into retirement. Our customized, educational workshops allow employees to learn strategies designed to get the most out of their company pension plan and prepare for retirement. We believe in providing a personal approach to servicing our clients. When calling our office, you will be greeted by a friendly voice willing to assist you. We believe you are important enough to personally answer your call rather than having a computer requesting your PIN number. It is this personal service that has enabled us to retain long term relationships with hundreds of clients. Gotleib & Associates is made up of a team of qualified financial planners, investment advisor representatives, and clerical staff who strive to make our clients feel important. We want each person who hires our firm to realize they have made the right decision. We are here to listen. Our Financial Planners have experience in the areas of estate planning, planning for the elderly, and retirement planning. By listening to our clients we design individualized investment portfolios based upon your risk tolerance, knowledge of investing, and time horizon. We want to gather as much information about you in order to make accurate recommendations. Our advisors are Registered Representatives. We specialize in retirement transition and Individual Retirement Account (IRA) rollover strategies. We are knowledgeable in the complex rules regarding lump sum investments, IRA rollovers and retirement plan distributions. What matters most to us is that our clients feel they can rely on us. We realize that the issues surrounding retirement can be complicated. Our job is to make your retirement transition as smooth as possible. We interpret the ins and outs of the retirement process and financial marketplace and explain how they affect you. It is important that you feel completely at ease with the decisions we make together and we believe understanding the process is essential to our relationship. We realize that the decisions you make impact your life and we don't take that lightly. We provide our client with solid, personalized investment planning targeted to your needs. The relationships we establish with our clients are designed to last a lifetime; therefore, it is imperative that we work together. At Gotleib & Associates, we are proud of our clientele. Our goal is to build lasting relationships through our personalized counseling and we would not have it any other way.